Scientists have designed a robotic stingray that could help our understanding of the human heart. 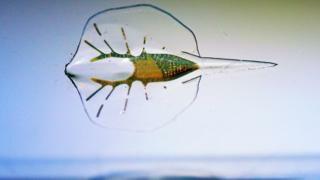 The miniature robot, one-tenth the scale of the actual fish, moves using heart cells taken from a rat. Researchers hope the robotic ray will give new insight into the heart's ability to pump blood and its potential implications in heart disease. "It turns out the musculature in the stingray has to do the same thing as the heart does: it has to move fluids," said lead researcher, Prof Kevin Kit Parker of Harvard University, US. The scientists reverse-engineered the marine animal to understand how it glides in liquid environments. They then built a robotic prototype, which contains a gold skeleton and a single layer of 200,000 cardiac cells wrapped in a gel-like material similar to the gel used for breast implants. The final tiny synthetic ray weighs 10g and is 16mm long. The cardiac cells had their DNA modified to be responsive to light. "When we have a light in the front [of the ray], we activate an electrical signal in the tissue and it propagates like a wave through the musculature," explained Prof Parker. "You get this undulatory motion of the fins, and it looks as if it is chasing the light." Each half of the robot is composed of different cardiac cells sensitive to specific light wavelengths. When picking one wavelength over the other, the scientists were able to steer the robot in a chosen direction. Using this guidance system, the robotic ray was able to negotiate a simple obstacle course. Researchers hope the robotic ray will help in the understanding of cardiac physiology. "We are making assumptions from our physiology textbooks that a heart beats the same way from every beat," Prof Parker told the BBC World Service - Science in Action programme. "But if you talk to cardiovascular surgeons, they would tell no, it always beats differently." As a robot with a soft body, the ray is one of the first of its kind compared with other technologies that use rigid frames based on the gait of insects or mammals. Another such robot is a jellyfish, developed by the same laboratory at the Wyss Institute in Boston.